← Chef Dean Thompson of Flights Wins Fire in the Triangle! Picture of the Week – Iris inside NCMA! This week’s picture comes from my very first visit to the North Carolina Museum of Art this past Friday for the weekly “Art in the Evening” event. I had no idea that inside the museum I would find Iris, a full service restaurant serving american fare with an international flare. According to those who have eaten there has some really great food. I’ve been told the brunch menu in particular is something to check out. 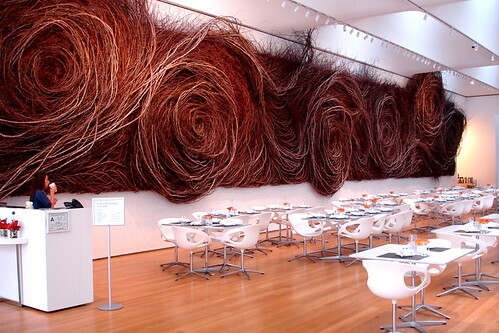 Of course being inside the museum means the dining setting is picturesque as well. I look forward to heading back soon to dine there. You can view their full menu on their website here. I love this picture! And I love that space. One of my Raleigh favorites!! Been there countless times, but have yet to eat at Iris! Chana, Thanks! I really enjoyed your recent photographs of the “0-60” exhibit! Art, I hope to eat at the Iris soon! I keep hearing great things about the food!